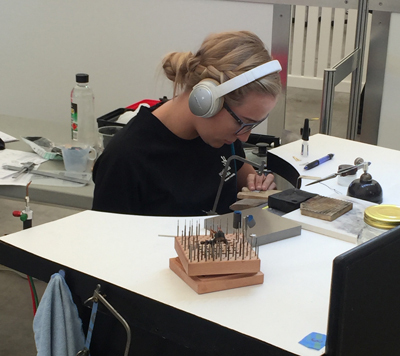 Aspiring, prodigious jewellery apprentice Hannah Alexander is making her mark in the jewellery world at a young age, chosen to represent Western Australia in the National Worldskills Competition in October 2016. The 19 year old won the honour of a Worldskills national selection off the back of an impressive performance in the state/ regional competition and she will represent Worldskills WA in the national competition alongside one other young WA jeweller, competing for gold and the chance for an invitation to the international Worldskills in Abu Dhabi in October 2017. 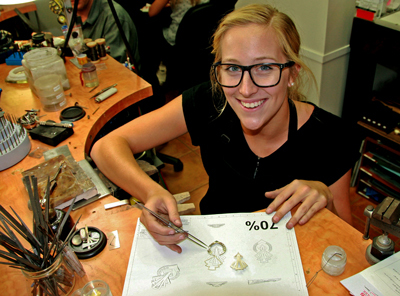 Practising under Creative Director and Master Jeweller Jodi Penfold and Master Jeweller Ty Portbury at Jewels of the Kimberley in Broome, Hannah began her apprenticeship in May 2015 and hasn’t looked back. Jodi, Ty and jewellery lecturer Peter Keep from the Central Institute of Technology encouraged her to enter Worldskills: a biennial trades competition for young apprentices across many industries. “I could not be learning from better jewellers, I have such a great team of mentors that have such a large wealth of knowledge and impeccable skills, without their support and care I would not have the skills to be attending a competition as prestigious as Worldskills,” she said. Hannah’s interest in jewellery started in high school aged 14, where she selected jewellery as a class. She completed her Certificate II in Jewellery, discovered her love and passion for the craft and the industry and chose the trade as her career path. She spent almost a year seeking out a jewellery apprenticeship around Australia and the world, applying for positions at around 70 jewellers. Hannah described Jewels of the Kimberley as an incredible place, as it is one of only a handful of Australian jewellers that manufacture all their own designs on site. The Broome jeweller specialises in fine, hand crafted designer ewellery which predominantly features South Sea Pearls and Argyle Pink Diamonds. “I have such a great exposure to some of the world’s most beautiful materials, that I wouldn’t get anywhere else,” Hannah said. Australia’s top jewellers, gemmologists and is now only one of three jewellers to have ever been invited to attend an elite diamond setting school in Belgium. “The opportunity Jodi has given me and her willingness to share her skills with me puts me in the best position I can be as a student, hoping to one day join her as one of Australia’s top jewellers,” Hannah said.